After making a victory lap of 10 million units sold in the course of three weeks or so, the Samsung Galaxy S5 is now landing in Japan. The NTT DoCoMo carrier version carries the same specs as the international variant, save for the branding at the front, and the carrier-specific services, like Xi LTE, VoLTE, One-Seg and NOTTV, which allow you to watch broadcast TV stations on the phone's 5.1" display. The kicker is, however, that in addition to the usual black and white versions of the handset, the Galaxy S5 there is also available in pink. It's not Hello Kitty pink, but still a pretty flashy color. 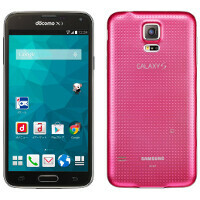 Samsung has the unorthodox blue and gold as official colors of the "glam" Galaxy S5 design, and now pink jumps into the mix, too. Do you like how the Galaxy S5 looks like clad in this new color? Hopefully Samsung will bring the pink S5 to the global scene, too, as we'd wager to guess there will be plenty of interest for the sake of being different alone. Hopefully HTC can show how bad the S5 looks in pink compared to the One M8 which, IMO, is simply a work of art. HTC is doing phone colors that are a lot more compelling than what Samsung is currently offering. that launcher is as ugly as a horses d**k! Even the normal touchwiz looks better than that. What version of samsung software is that? Don't worry I wasn't referring to you, as I was talking about the colour of the handset. But I agree with your comment though, as that launcher does look pretty horrendous... maybe the software could be a carrier specific launcher? Xfffffff You are Stupid as always..! Very nice color sammy..keep it on.! S5 is the best by faaaaar..! May 27 this charade of a phone will be over. A chassis is different from a cover.